In Delaware, only dogs are provided for in animal control contracts with the counties. There are no agencies that will pick up free-roaming cats. If you find a cat, it may be someone’s pet that they allow outdoors, it may be a lost or abandoned pet, or it may feral. Figuring out what type of cat is the best way to determine how you can help. Follow this link for detailed information and helpful tips. Friendly cats who appear well fed and groomed are probably pets whose caretakers allow them outdoors. If they look healthy and they’re not bothering you, the best thing to do for these cats is nothing. Stray cats are pets that have been abandoned or lost. They are used to contact with people and may approach you to seek attention. Others may appear feral at first, but once you befriend them, you’ll find that they enjoy human touch. If you find a stray cat that you do not believe is being cared for, the best thing to do is catch her and attempt to find her original family. Take her to a local veterinarian or animal shelter so she can be scanned for a microchip. Check for lost ads in your local paper and animal shelter. File a found report with your local shelters in case her owners are looking for her. Follow this link for more tips. If no one claims the cat and you’d rather not keep her yourself, you can re-home her or give her to a rescue group or shelter so she can be adopted. Re-homing her yourself is ideal as most shelters are already overwhelmed with homeless animals. More info helping stray cats. 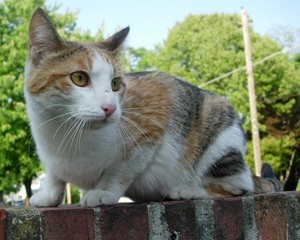 Feral cats are not socialized to people and live on their own outside. They are usually too fearful to be handled or adopted. Feral cats often live in a group of related cats, called a colony, but if food is scarce they may roam alone. A colony typically occupies and defends a specific territory where food and shelter are available, such as dumpsters or restaurants, beneath porches, or in abandoned buildings.Because a female cat can become pregnant as early as five months of age, the number of feral cats in a community can rapidly increase if cats aren’t spayed or neutered. 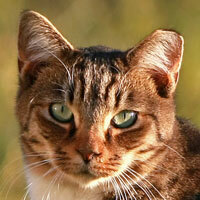 How Can You Help Feral Cats? The best thing you can do for the feral cats in your neighborhood is to vaccinate them, have them spayed or neutered, and return them to where you found them. TNVR (Trap-Neuter-Vaccinate-Return) is a humane and effective program that ends the birth of unwanted litters, stabilizes the cat populations, improves the quality of life for the cats themselves, and prevents the spread of disease. If the cat has a notched ear, it is a sign that it has already been spayed or neutered and vaccinated. See picture of ear tipped cat on the right. After TNVR of a cat or colony of cats, it is ideal if a dedicated caretaker provides food, water and shelter; monitors the cats for sickness or injury; and TNRs new feral cats who arrive. Ideally, kittens young enough to be socialized and new tame cats who arrive are removed from the colony for possible adoption.